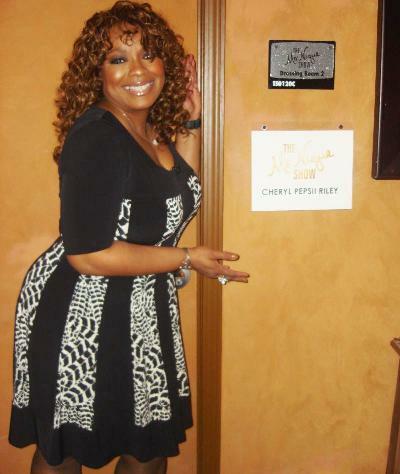 *Soul singer Cheryl Pepsii Riley is enjoying her day in the sun. The songstress, who achieved popularity in the late ’80s with her hit release, “Thanks for My Child” has been keeping her brand alive these day performing via Tyler Perry’s many blockbuster plays and movie soundtracks, her fresh and compelling independent CD release, “Let Me Be Me,” and hosting a weekly talent showcase at the Village Underground in New York. Her latest play, Tyler Perry’s “Madea’s Big Happy Family” is currently available on DVD with interest refueled in the production by the film version’s recent release in theaters. Riley reunited with Tyler Perry and cast members from “Madea’s Big Happy Family” on the set of “The Mo’Nique Show” where she delivered a titillating, show-stopping, solo performance as part of a medley of songs performed by the cast. The performance received a standing ovation! The episode airs on Tuesday, April 26 on BET at 11:00 p.m. EST/PST. Keep up with Cheryl Pepsii Riley at http://www.CherylPepsiiRiley.com and catch her on Monday nights as she hosts her “Back in the Day, Black Velvet Painting, Blue Lights in da Basement, Musicians and Singers Jam” via webcast on www.TheVillageUnderground.com.